That seems to be the question I hear most these days. There are several factors to consider when determining what’s best for your pet. Coat condition, skin, environment, as well as how your pet will feel. If you have major shedding issues at your house there are options without shaving. We use grooming techniques that will minimize the shedding at home generally referred to as a De-Shed Treatment. If you don’t mind your pet being shaved and you feel like they will be more comfortable, then we can of course zip the hair right off and this too will keep the hair around the house to a minimum. Just keep in mind breeds that are prone to shedding will still shed when shaved, the hair will just be shorter. De-Shed treatments, proper nutrition and exercise will work best for long term results. 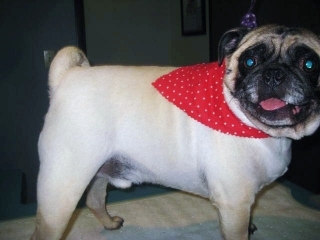 Pictured below is ELVIS– one of the coolest Pugs I know. He’s just had a summer shave, and if you’ve ever had a Pug you’ll understand why Mom and Dad opted for a trim this time. Puggy’s are sheddin’ machines! This entry was posted on Tuesday, August 24th, 2010 at 4:57 pm	and is filed under Uncategorized. You can follow any responses to this entry through the RSS 2.0 feed. Responses are currently closed, but you can trackback from your own site.